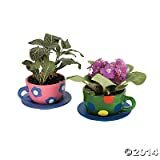 Happy Sales high quality cast iron teacup has bamboo design & is adept for enjoying tea. It can also serve as a great companion for any cast iron teapots (tetsubin). 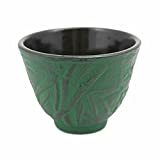 This classical Japanese style teacup is made from sturdy iron and has enamel coating on the interior to prevent rusting. Japanese style cast ironware heats evenly and retains heat well and is praised worldwide for their beauty, strength, and superb quality. Approximate Dimension: 2" height x 2 3/4" diameter. Set of 4 reddish brown cast iron tea cups with porcelain enamel interior coating. HIC’s Porcelain Blue Willow Cups and Saucers depict the popular and highly collected Blue Willow dinnerware design. Originating in England, circa 1780, this richly illustrated design, featuring a weeping willow, pagoda, bridge and lovebirds, portrays the Chinese legend of a wealthy man’s daughter who’s fallen in love with her father’s clerk. Blue Willow is casual enough for use every day, yet elegant enough for those special occasions. 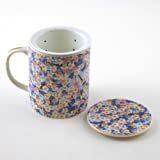 These beautiful 8-ounce mugs with matching saucers are adept for enjoying coffee or loose leaf teas, hot chocolate, spiced cider, even warm milk and honey, and other beloved beverages. Crafted from fine-quality porcelain, they’re durable with a natural heat-retaining characteristic to help keep beverages warmer longer. They perform equally well for cold drinks, like iced chai. They make great gifts for art enthusiasts and tea lovers, or hostess gifts and coffee gifts for at-home baristas. A tradition since 1957, HIC Fine Porcelain is safe for use in the microwave, oven (to 500-degrees Fahrenheit), and freezer. Dishwasher safe for easy cleanup. 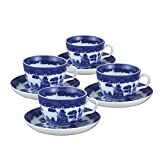 Set includes 4 (8-ounce) Blue Willow Cups and Saucers. Fancy yourself as bit of a photographer? Boldly display your photo fanaticism by using this quirky new mug. It looks and feels exactly like a real camera lens and will soon become an essential part of your photographer's kit bag. 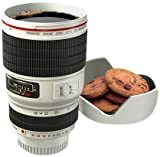 The multipurpose lens cover lid is immaculate for keeping your beverages hot and can also be used as a coaster or a novelty holder for your popular biscuits. Kick start your day with a coffee in this professional mug. 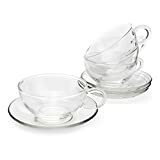 4-Elegant handblown glass cups and saucers. The cups and saucers present a very clean and simple distinct line. The handles are very easy to hold and substantial. Serving size of the cup is 170 ml. Color: Light Green * Design: Dragonfly * Capacity: 3.5 fl.oz . * MEAS: 2-7/8in Dia. x 2in H * Material: Cast Iron * Enamel coating interior to prevent rusting.